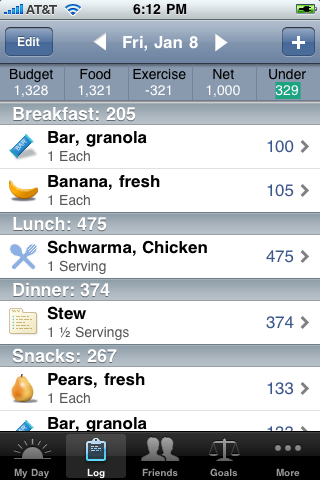 Bend Bits | Satisfying my food cravings, one bit @ a time. Many people make a pilgrimage to Deschutes Brewery for the Beer. I go for the food. This is a Pub with great food. Hang at the bar for a pint or enjoy a meal. My husband and brother both enjoy the beer. My 3 favorite dishes at Deschutes Brewery are Fish n Chips, Reuben and Sweet & Spicy Mac n Cheese. You must try the house sweet & spicy mustard. I often substitute the sweet potato fries for the regular fries or salad. I have traveled up and down the west coast with my husband searching for the best Fish n Chips. 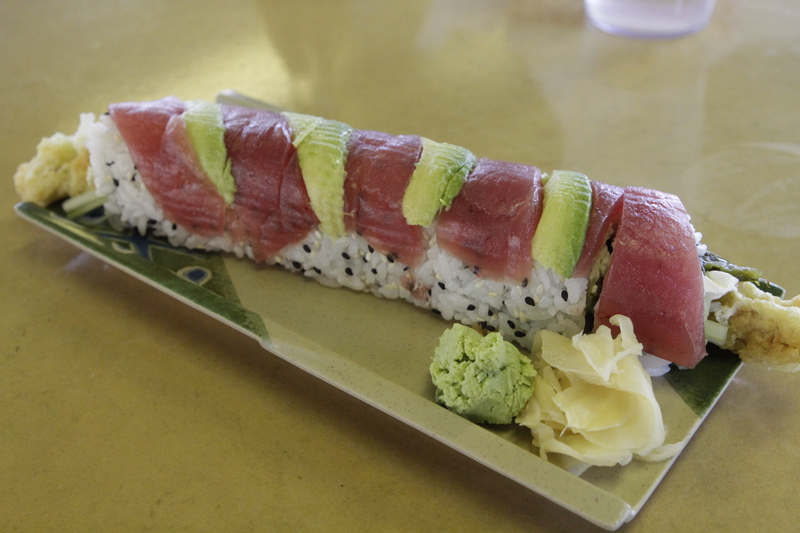 We expected to find the best on the ocean but we were pleasantly surprised to find the 2 best places in Bend. Deschutes is tied for 1st. The fish is thick & smooth. The breading is very light allowing the fish to be the star, not the bread. The reuben is on a marble rye bread. The meat is juicy & fresh. I must have cole slaw on my reuben, the cole slaw here is perfectly light, not mayonnaisey. 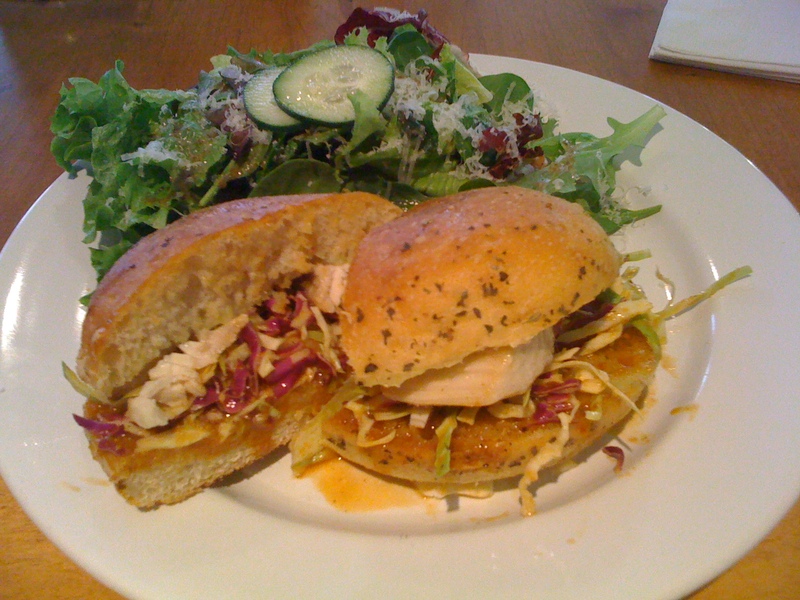 The mustard is not in the sandwich but in the jar, it adds another unique element only available at Deschutes. 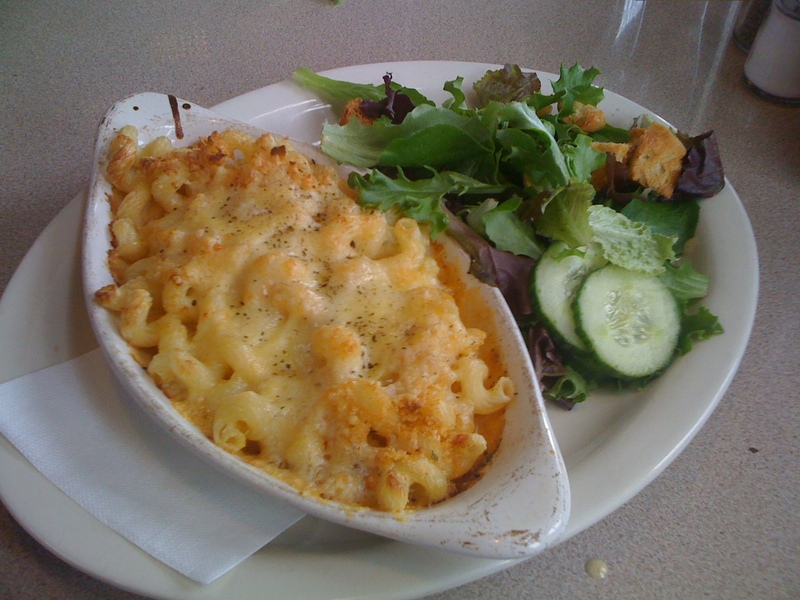 Last but not least, Sweet & Spicy Mac n Cheese. Shells instead of macaroni Pasta allow more of the sauce in the spoon. The cream sauce has an Asian flavor. $11 for a vegetarian dish, $15 with meat (smoked salmon is my favorite). Get a free pint if you donate blood to the American Red Cross on “pint for a pint” day sponsored by Deschutes Brewery (you must bring the coupon from the Red Cross). Chow is located across the street from Newport Market. Walking in you are quickly greeted & seated. Nearly every table is full, in the dining area of this charming house turned restaurant. Space is limited but well worth any wait you may encounter (we didn’t encounter a wait). Grace & I split a Roasted Natural Beef Brisket, Chipotle Aioli, Queso Fresco, Tomato, Avocado, Roasted Jalapeno, Greens for $11, this included a choice of side. Fresh Vegetable Spring Roll with Peanut Sauce (usually $3). I also had a chance to try my husband’s side of grilled squash. I can’t believe it took me so long to try Chow. I will be back, very soon. It will be hard to order something else on my next visit, the Brisket was delicious. Everything I saw looked so good, I hope to eventually try everything on the menu in the coming visits. Next time I have the spring roll, I will order it without the onions. I wouldn’t change anything else. I briefly spoke with one of the owners on my way out, he said everything is made from scratch. So much to do, so little time. I am back & plan to regularly post again. I haven’t stopped eating out or taking photos. I have done quite a bit of traveling though so it doesn’t quite fit into “Bend” bits. I just downloaded the iPhone app so I can easily post on the go. I will be taking a beginning photography class at the end of the month with my new camera. This should allow me to provide photos that do the food justice. Photos taken in a dark room on the iPhone don’t come out as well as the ones in a brightly lit room. We want to be fair all around. 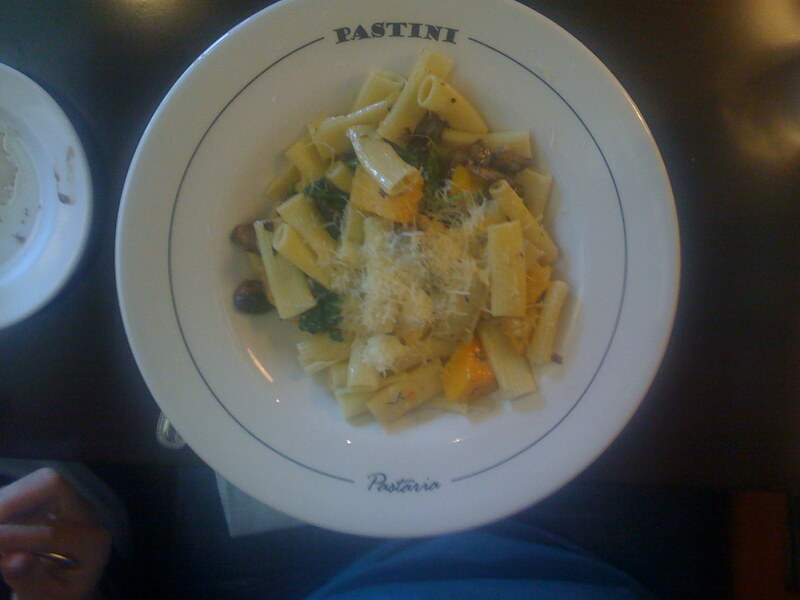 Pastini is another nice addition to the upscale Old Mill restaurants. The interior is modern with lots of windows overlooking the Deschutes River. The staff was friendly & gladly moved us to a booth closer to the river view when we asked. You will be served with complimentary bread, oil & vinegar. The food is delicious but there were a few hitches. We ordered a double noodle dish for $1.75 more, they forgot to add the extra noodles in the cooking process so they brought additional noodles on a plate, the additional noodles minimized the flavor after they were mixed in. The butternut squash was wonderful but some pieces were not fully cooked and a little hard. I will try coming back another time to base the rating on more than one experience. The spaghetti & meatballs were very good, the meatballs were very large & resembled a very good meatloaf. The Parmigiana Bread is very good, the red sauce that comes with it is the best sauce I have tried (I usually don’t like any red sauce) I will order this again.